Portugal has drawn some worldwide attention as one of the best European destinations for nature walks, beach time, tech-savvy and food discovery. Famous for having some of the best fish and seafood on the planet, widely coveted by chefs and visitors alike. However, unbeknownst to many, Portugal has a very strong meat culture. In fact, the North of the country is an authentic haven for the avid carnivore. The culture insists—and persists—that the animal should be eaten from head to toe: that nothing should go to waste. And the amplitude anatomical variety added to necessity and creativity made way for the creation of a rich repertoire of dishes. Porto, the country’s second largest city, has rightfully claimed its title of capital of the North. A ferociously independent city, with strong-willed, yet hospitable and friendly people. A land of merchants and sailors, shaped by wine and a prolific industry, a city that built its own legacy through the ages. In this legacy, we see Porto’s gastronomy as a melting pot of the gastronomy and ingredients of all the northern region. We will guide you through the mandatory Portuguese dishes that all visitors should try, and the Porto restaurants that make these specialties shine. 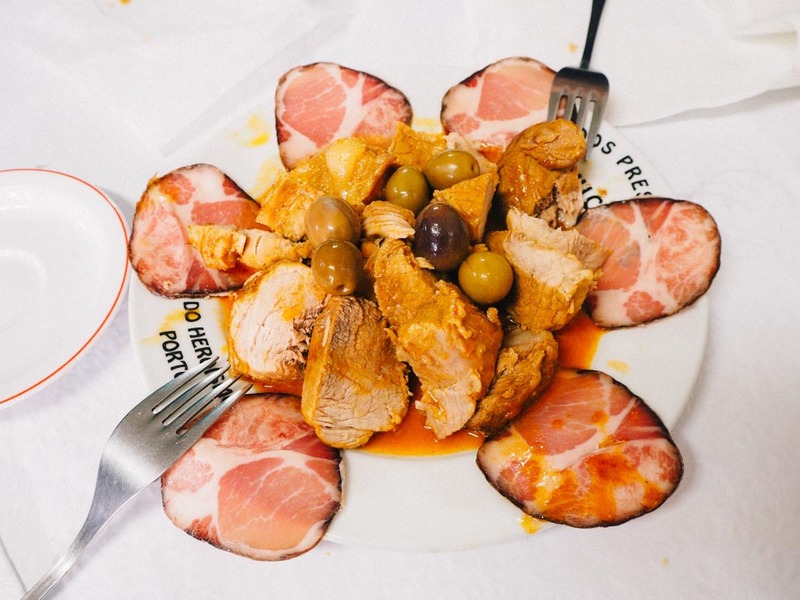 If there is a dish that represents the city, it is undoubtedly tripas à moda do Porto. 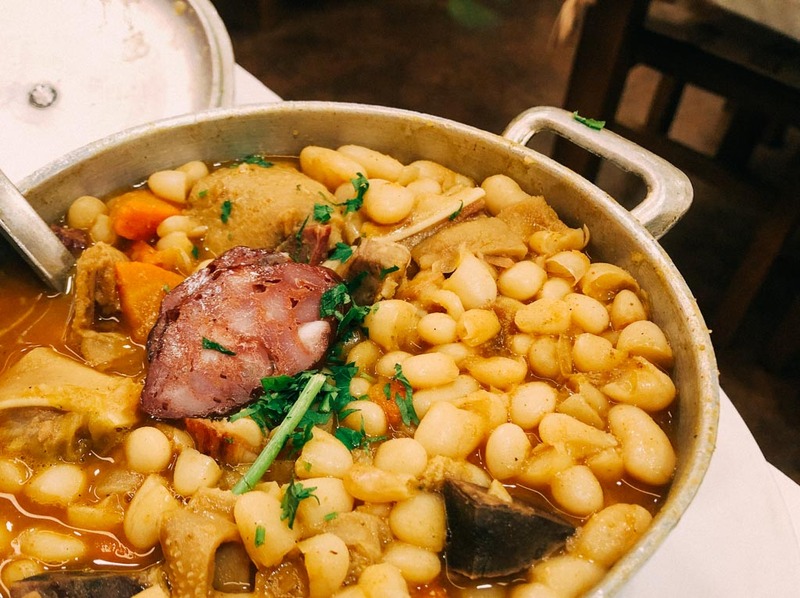 This creamy, hearty white bean and meat stew are subject of diversity of legends associated with Porto’s history. These legends revolve around historical events in which the people of Porto had to sacrifice all of their meat in name of a cause, being left with only the tripas (tripe) to eat—the symbolism of this action made the Portuenses to be known as tripeiros (tripe-eaters). Resourcefulness appeared in a time of need, and with some creativity, this delicious dish was born. Irrespective of its true origin, this dish has persisted through the centuries and remained close to the heart—and stomach—of the people. As you can imagine, eating tripe can be a delicate topic so you shouldn’t rush into any indistinct location. The opposite of that is the Restaurante Líder, which is probably the best place in town to savor this meaningful delicacy. Owned by the founder of the brotherhood of the Tripas à Moda do Porto, Líder takes no shortcuts with the cooking time or ingredients, culminating in a dish with deep and comfortable flavors. This is the ideal meal to warm up the cold winter days, but it’s available daily, all year-round. 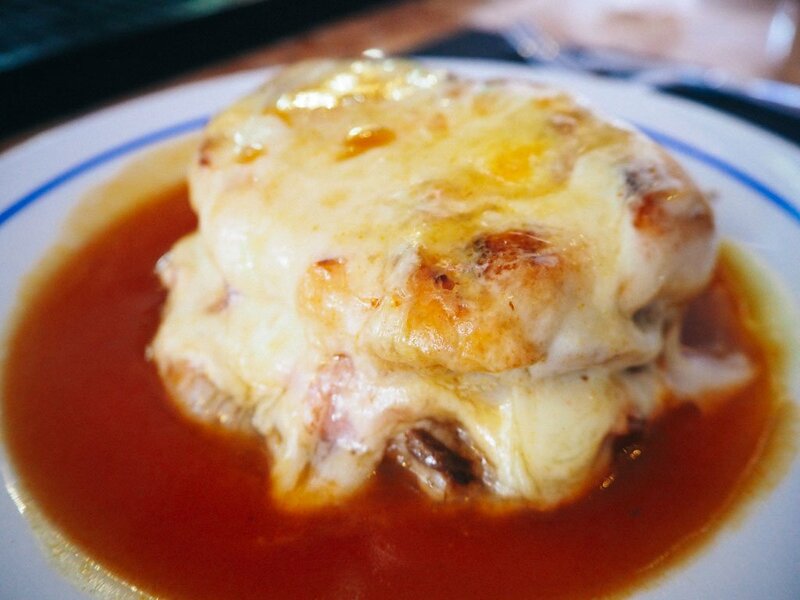 The francesinha is undoubtedly Porto’s most famous sandwich. If you’ve heard of it, you’ll know about the gargantuan array of cured and fresh meats encased between two morsels of bread, coated by melted cheese, and bathed in spicy sauce. Originally created in the 1950s, the francesinha soon spread throughout the city to the point that almost every eatery serves it. This apparently defenseless sandwich seem like too much for the shyer stomach, but when prepared with care it remains a delightful treat up to the last forkful. If you’re looking to devour a prime specimen, head over to Bufete Fase. This tiny, family-run snack-bar is solely dedicated to producing the monster sandwich. Each francesinha is prepared by request and then covered by an exceptional homemade sauce that melts the cheese to perfection. Always a beautiful view, we can assure you. Another particularity that the Portuguese are well known for is their unquestionable love for salted codfish (bacalhau). Although not fished in national waters, this fish is brought from the colder parts of the Atlantic, and the Norwegian Sea by the tonnes. 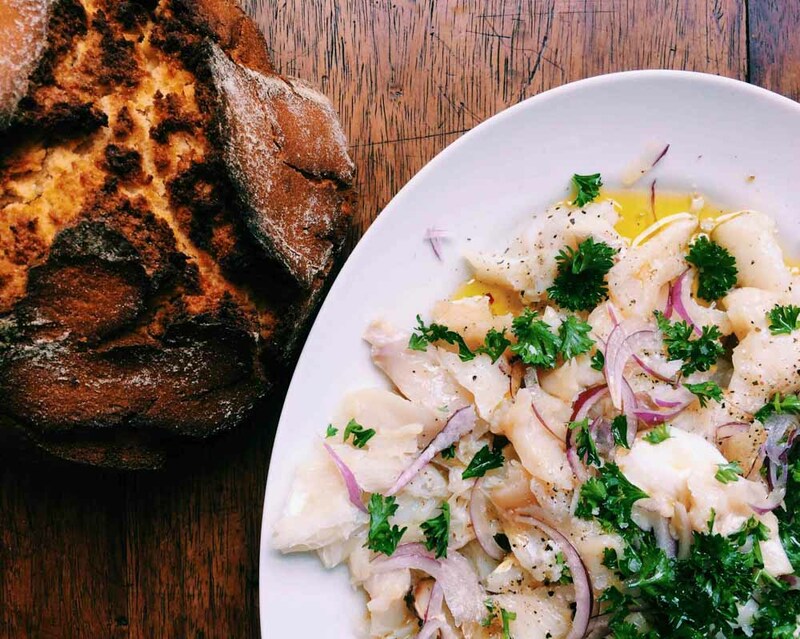 There’s an anecdote that boasts that there are 365 Portuguese recipes for codfish, one for every day of the year. Forget that; there are probably many more. Some of the most beloved ones, however, were conceived in Porto’s restaurants and homes. It’s the case of bacalhau à Zé do Pipo (codfish baked with mashed potatoes, mayonnaise, onions, and olives), and bacalhau à Gomes de Sá (milk soaked cod, cooked with olive oil, potatoes, olives, and egg), for example. Casa Nanda is dear to locals, who fawn over their delectable dishes. As expected, codfish is multifaceted. If you want a simple, yet traditional approach, you can try out the crunchy bolinhos de bacalhau (codfish croquettes) or their close relatives, the pataniscas (codfish fritters). If you’re looking for heartier main dishes, you can find the aforementioned Porto-born recipes and others like succulently fried codfish fillets. When in season, try their marvelous pink peach salad. Much in the same spirit of the francesinha, this is another recipe that belongs to Porto’s singular fast food culture. The cachorrinho came to be in the 1960s: at last, Porto’s very own hotdog version! Its unique identity, though, makes it quite different from the American version. First of all, the magic starts with two special (and locally sourced) grilled sausages—fresh sausage and linguiça (a spicy sausage). Both are uncased and spread inside a little wheat baguette, grilled, topped with cheese and a spicy sauce, only then to be finely sliced. The result: the most addictive snack you’ll ever come across. The other special thing about the cachorrinhos is how far and few between you’ll find them (at least the good ones). You’ll find the best concentrated in a single block in downtown Porto, starting by Cervejaria Gazela, their birthplace. 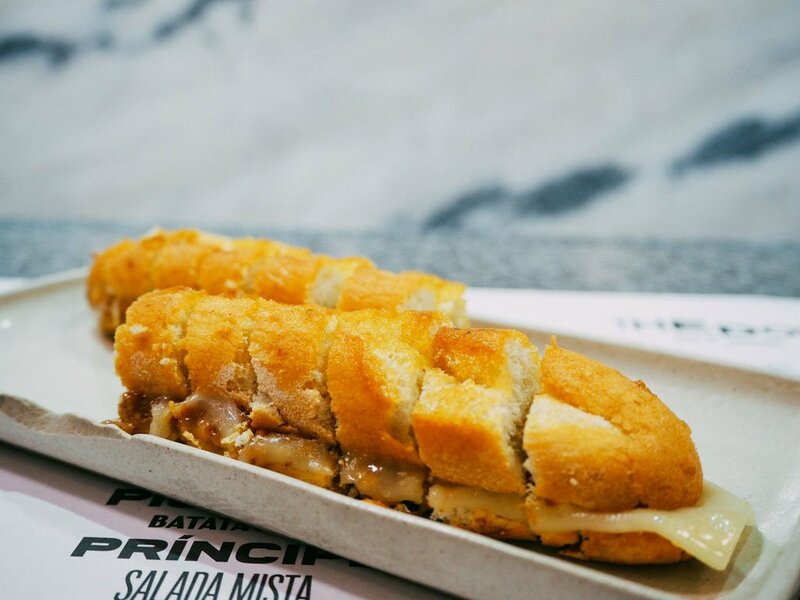 The preparation of these cachorrinhos and the ingredients used are kept to the highest standard, meaning that any hour of the day is good for a cachorrinho (or two). A genuinely Portuguese way of eating is through petiscos—small portions of food, in similarity to tapas, but with Portuguese recipes. Usually, each eatery specializes in their own version of petiscos. These can range from boiled cuts of meat, meat stews, fried fish, cured meats, escabeches, and more. Petiscos are often eating during the afternoon, sided by some crisp regional wine. They can easily replace a full meal and are a great way to try out different Portuguese delicacies in one sitting. One of these places is O Buraquinho—quite literally, an underground tavern—which has been around for almost a century. It specializes in serving pork meat in all its manifestations. Indeed, the most popular request is the pratinho misto: an assortment of pork from snout to tail that will include morcela (blood sausage), smoked ear, stomach, belly, and the offbeat favorite floured intestine (tripa enfarinhada). The Portuguese aren’t shy about dessert. Neither in the number of sweets they can ingest, nor in the number of recipes they have with just egg, sugar, and flour. Some of the most impressive sweet recipes spread nationwide through convents and monasteries, where the recipes were developed to perfection for centuries. Well-known examples of conventual pastry are, for instance: the pastel de Tentúgal, ovos moles, pão-de-ló, or the pastel de nata. 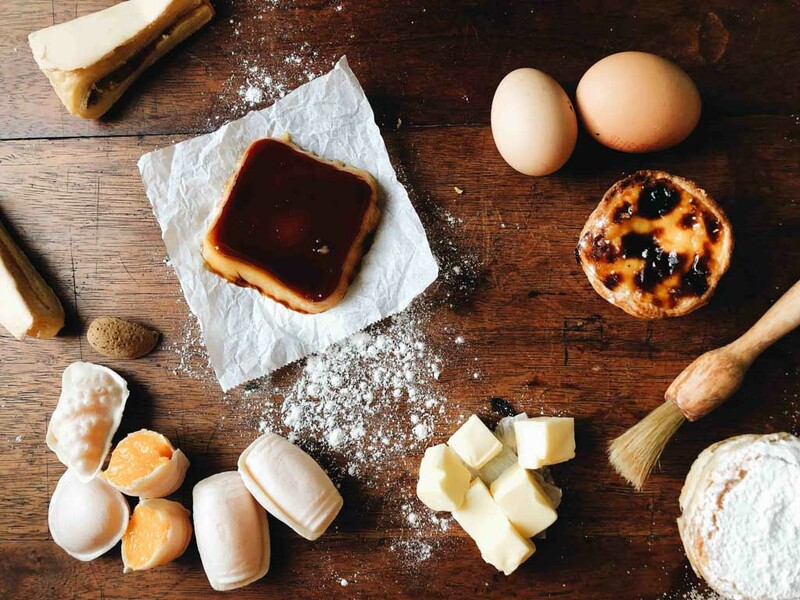 The pastel de nata is surely the most borderless Portuguese sweet, as its crunchy puff pastry and creamy custard has found popularity all over the globe. While in Porto—or in any other Portuguese city—it’ll be hard to find a coffee shop that doesn’t sell pastéis de nata. But that’s hardly a good thing because too much abundance often means low quality. That being said: you should stick to the one place that prepares it from scratch every day. Oh yes, at Manteigaria the pastel de nata is always crunchy, and the custard is a warm flow of tear-jerking cream. One bite into it and you’ll be addicted for life. One shouldn’t dare come to Porto and not appreciate as much port wine as possible, be it in the glass, or in the mind. The baffling range of colors and flavors that compose port wine will dazzle your mind; you’ll bear vivid memories of the nutty and woody aromas of tawnies, and the complex fruit and flowers of vintages. If you’re not willing to free your inner wine-nerd, then you can also enjoy the many port wine cocktails out there. The most famous is surely the port tonic, a rendition of the gin tonic, but with crisp white port wine instead. Going to the Royal Cocktail Club is like a sojourn in a cocktail Valhalla. The flavors—and the experience—that these guys can create inside a glass are memorable. 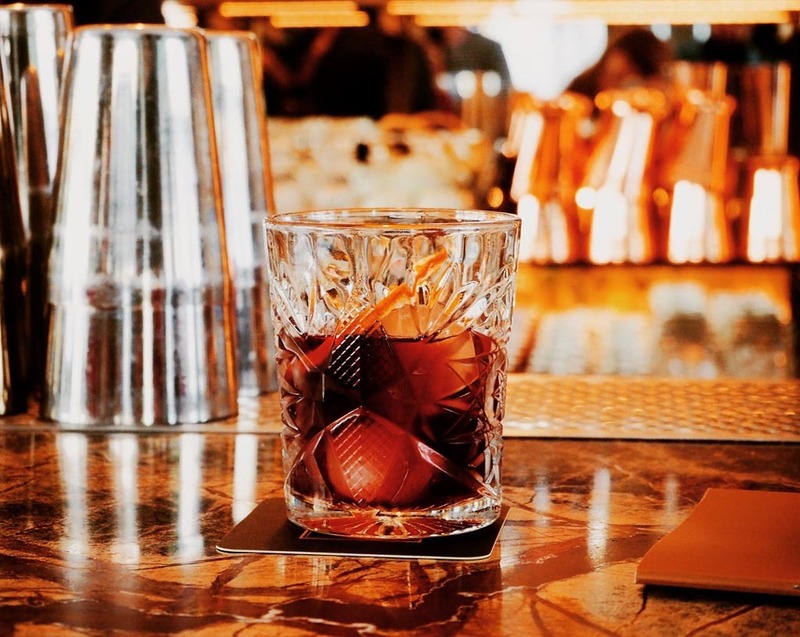 Fronted by some of the world’s best barmen, the list of cocktails is vast, and the concoctions vary from popular classics to their own creations. Cocktails with port wine are permanently on the menu. Bruno and Maria are award-winning food writers and bloggers based in Porto, Portugal. They delve into the best food and restaurants in town, bringing it to light through their writing, but also through their exclusive food tours. Some of them I’ve tried already, and I want to try the rest!